23 December 2003 - May you and your loved ones enjoy the true meaning of Christmas and have a prosperous New Year. Let's all give thanks for what we have and pray for a more peaceful year in 2004. 20 December 2003 - I have two Mirage repaints this time. The first is a repaint of the overall gray Mirage F1 originally by Manuel Marín Carrión and myself. This new version, repainted by Oscar Onrubia, represents an F1M of the Ejercito d'Aire Español at Los Llanos AB with Tigermeet paint. The second is a repaint of the Mirage IIIEBR by Denis and Daniel da Silva Oliveira painted as a Mirage IIIEE of the Ejercito d'Aire Español. 10 December 2003 - I put up the annual Holiday Season's Greeting on the Home page. I found a nice winter looking image of a Mirage 2000D at Exercise Joint-Winter 2003 in Bodo, Norway. The image is from the Escadron de Chasse 2/3 Champagne website. Daniel Nole has taken one of the older Mirage III (1998 by Paul Kimberling and Joël Branchu) and repainted it as a Mirage IIIEA as flown by the Fuerza Aérea Argentina during the Falklands Conflict of 1982. Daniel had added animation and reworked the flight model. The aircraft is intended for use with CFS/CFS2 and includes a DP file and two missions. Using this simpler visual model should keep the frame rates down. 7 December 2003 - Y.Raymond of France sent a set of textures for the freeware Alpha Simulations Super Etendard. The aircraft represents No. 51 and carries the unit badge of Flotille 17F. This Flotille is stationed at Landivisiau BAN. I've been using the Landivisiau BAN scenery by Sonny for some time and just realized that I had not added it to this website. It is available here now. 3 December 2003 - It won't be freeware but for those Mirage enthusiasts with a little extra in the wallet after the new year, Alpha Simulations has a Mirage IV for FS2002/FS2004 in the works. Two versions will be available, an IVA and an IVP. The designer is David Bushell who made their awesome SR-71. Visit the News and Preview pages of the Alphasim website for images. Even though Alphasim is a payware company they have from time to time made their payware titles available as freeware. Examples on this website are their earlier Mirage IVA and IVP, Mirage IIIB-RV, Super Etendard (Aéronavale Francaise and Aviones Armada Argentina), and IAI Kfir C2. 29 November 2002 - Yesterday marked the fourth anniversary of this website. As you can see below, a lot has happened this year. Please take a few moments to read my review of the past year. 23 November 2003 - Jens-Ole Kjølberg of Norway has put together a package of four different liveries that span the 17-year career of the Cheetah D with the South African Air Force (SAAF). The package uses the “old” (FS2000) Cheetah D model made by Jason Ashworth. Three different models of the aircraft are included. The package also includes two different instrument panels; an early Cheetah D cockpit with canopy frames and a new frameless cockpit of the updated Cheetah D. The aircraft is for FS2002 only and includes all new textures. 14 November 2003 - Thinus Pretorius (Mirage IIIB and Cheetah C instrument panels) of South Africa recently toured the South African Air Force Museum at AFB Swartkop and sent a few images. I've added them to those sent earlier by fellow South African Jason Ashworth (Mirage III and Mirage F1). There were some problems reported with downloading the Mirage III and Kfir/Cheetah aircraft released by Denis and Daniel da Silva Oliveira. I have updated the links to download the aircraft directly from this website so there should not be any further problems getting the aircraft. There were similar problems reported with the Mirage F1 converted for CFS2 by Chuck Dyer. I have corrected that problem in a similar fashion along with the Mirage F1 instrument panel and sound package Chuck released. 11 November 2003 - To celebrate the first year anniversary of his website, GmaxFlight, Cyril Pioffet has updated the design. It looks good. See for yourself. 6 November 2003 - Gregory "Bill" Lugan of France has released a set of textures for use with the Rafale M of Cyril (Gator) Pioffet. The subject aircraft is N°18 (not yet in service) of 12F Flotille in an operational (and weathered) scheme. Installation instructions in English and French are included. Jean-Jacques Herve has updated his scenery of Lorient Lann-Bihoué (LFRH) for FS2004. Visit his website to download this latest version. 30 October 2003 - It has been a slow week. The big news is the wildfires in my back yard here in San Diego, California. We could easily see the Paradise Fire from our home in Escondido during the day and at night. Greg McEwan of South Africa is working on a repaint of the Kirk Olsson Mirage F1C in the early camouflage colors of a South Africa Air Force Mirage F1CZ. It should be available in November. Greg sent some FS2004 screenshots to show the progress. 18 October 2003 - No new aircraft this past week. Cyril (Gator) Pioffet continues to work on his Mirage 2000 and has displayed several new images of the Virtual Cockpit and instrument panel on his website. They are starting to look so real that I'm surprised Dassault has not contacted him to create a VC for their own use. It looks great Cyril. Denis and Daniel da Silva Oliveira released three instrument panels earlier this year. But they have not been available for download from their website for a while. I have located copies of the files and they can now be downloaded from this website. 11 October 2003 - Andrew Whitney has painted a fictitious version of the Rafale M by Cyril (Gator) Pioffet in Argentina markings. The textures include the traditional blue and white rudder stripes of the Armada Argentina. Benoit M. Dubé of Canada has modified the instrument panel of the Super Etendard Modernisé by Romain Lucas. The modifications add a GPS, an HSI, a new ADI, and a new green/red HUD. 7 October 2003 - The lastest edition of FSIn-flight Magazine has been released. There are no articles on Mirage aircraft but there is a good review of Kirk (Mirage F1) Olsson's newly released F-16. One of the images sent in by Nikos Delhanidis shows an unfortunate Hellenic Air Force F-16 squarely in the gunsight of a Mirage F1CG. This latest edition also serves to introduce a new readership debate – Payware vs Freeware – a long time concern of Flight Simmers, which will no doubt coax some interesting opinions in the FSIn-flight Forum. 5 October 2003 - I have repainted the original Mirage IIIRS by Denis and Daniel da Silva Oliveira in the special colors worn by R-2103 beginning in early 1998 to mark it as the first Mirage IIIRS to reach 3000 flying hours. This scheme was retained for the remainder of the aircraft's career. 29 September 2003 - Eduardo Fadul has updated the textures for his Fuerza Aérea Colombiana Kfir C7 and Mirage M5 COAM, both designed by Denis and Daniel da Silva Oliveira. He has also released another version of the Mirage M5 COAM in an overall low-visibility gray scheme. 20 September 2003 - Mukherjee Kalyan painted a series of combat aircraft representing the modern Indian Air Force. Included is a Mirage 2000H of No.7 Squadron. For the visual model he used the Mirage 2000 by Oxyd with the flight dynamics file by Benoît M. Dubé. Cyril (Gator) Pioffet has been working on the instrument panel Multi-Function Display gauges for his upcoming Mirage 2000. On display at his website are several images showing autopilot, radios, engine status, fuel, navigation, etc. 15 September 2003 - Earlier today this website had its 200,000th visitor. Thank you all for making this website a success. 14 September 2003 - Mukherjee Kalyan of Switzerland has repainted the Mirage IIIRS by Denis and Daniel da Silva Oliveira. The new schemes (two texture sets are included) are of the Swiss Air Force R-2110 "black over white" and R-2116 "white over black" schemes seen at Special Recce Meet 2003. Alpha Simulations has just made their Israeli IAI Kfir C2 available as a freeware download. I wrote a review on this aircraft when it was released in January 2001. I have updated the links from when the aircraft was originally offered to reflect this new freeware status. 11 September 2003 - In memory of those lost on September 11, 2001. We will never forget! 6 September 2003 - Daniel Borrego has painted up a Mirage 50DV trainer in the colors of the Venezuelan Air Force (FAV) using the Mirage III trainer by Denis & Daniel da Silva Oliveira. Alpha Simulations has made *all* of their CFS2 modern weapons (bombs and missiles) available for download free of charge. These files can be used by freeware designers to enhance their CFS2 creations. Included are many types of bombs and missiles, various dumb and laser-guided bombs, and all come with their own textures and .dp file. As with all Alphasim freeware, these files are strictly *not* for resale. You can download these files and all of their other freeware files by clicking on the "Freeware" link on the Alpha Simulations website. 2 September 2003 - Ricardo Ruffa has been very busy painting a series of Mirage IIIEA and IIICJ in the colors of the Fuerza Aérea Argentina. Using the Mirage IIIC and IIIE by Jason Ashworth, Ricardo has released six aircraft representing various units. 28 August 2003 - One of the first "Mirage" aircraft released for Flight Simulator was the special "Spotty" Cheetah C by Anton Coetzee in early 1996. Jens-Ole Kjølberg of Norway has now repainted the new Cheetah C by Jason Ashworth in the colors of this famous aircraft. This new version by Jens-Ole includes two sets of textures to represent the initial scheme with white tail for the SAAF 75th Anniversary and the later (and final) version with the tail graphic. Leigh Jackson of South Africa has shared his description and images of the final flight of "Spotty" as well as images of an operational SAAF Cheetah C.
23 August 2003 - Marcel Ritzema of the Netherlands has made a small modification to the already great instrument panel included in Super Etendard Modernisé by Romain Lucas. The modification adds a VOR1 gauge for ILS approaches. Marcel has also brought to my attention a scenery he made for the Dutch Naval Air Station Valkenburg (EHVB) located near the capital city Den Haag. The scenery is well made, very detailed, and includes charts and navaids. Cyril (Gator) Pioffet has returned from his vacation and is working on his Mirage 2000 again. He has posted new instrument panel images as well as two videos showing the canopy/pilot animation and the aircraft in flight. You can view these on Cyril's website. 17 August 2003 - Frédéric Hauger of France has extensively reworked and upgraded his scenery of Colmar-Meyenheim Air Base (LFSC) released earlier this year. He has rebuilt the base from the entry gate to the control tower and all roads in between (literally). Eduardo Jarabo of Spain has created an AFCAD file for use with the Los Llanos Air Base (LEAB) scenery by Manuel Marín Carrión released earlier this year. Jean-Jacques Herve has updated his scenery of Lorient Lann-Bihoué BAN with new details and has also made it FS2004 compatible. 13 August 2003 - On June 30th the Mirage F1CG ended 28 years of service with the Hellenic Air Force. For the end of service ceremonies two aircraft received special paint schemes. Nick Delhanidis has scanned some images and I have added them to the Mirage F1CG gallery page. 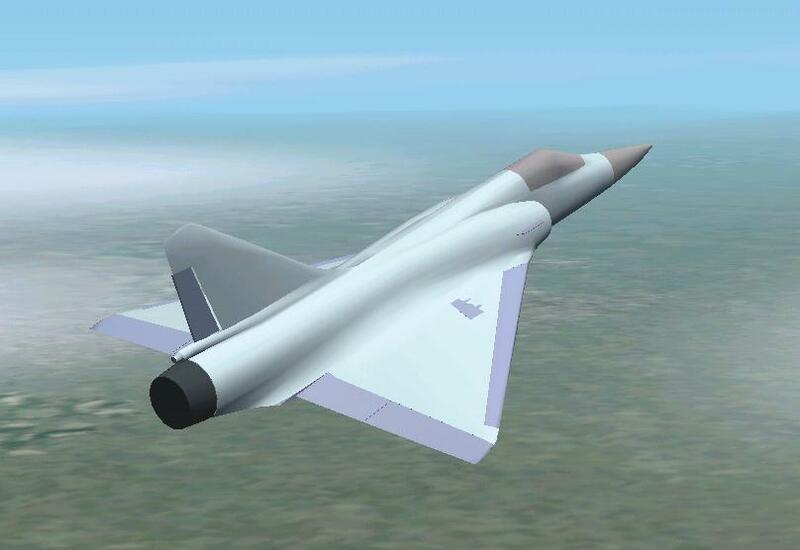 9 August 2003 - Alpha Simulations has decided to release their Aéronavale Francaise and Armada Argentina Super Etendard aircraft (without panels) as freeware. The aircraft include all necessary files for use in FS2000/2002 and CFS2 (the latter including missions and the add-on fuel tanks and weapons: Exocet, Magic II, SNEB rocket pods). I wrote a review on this aircraft when it was released in May 2001. I have updated the links from when the aircraft were originally offered to reflect this new freeware status. Maybe someone will adopt these weapons to the new Super Etendard from Romain Lucas? If you do, let us know. 2 August 2003 - It's hard to believe it is already August. Thinus Pretorius of South Africa has completed a new instrument panel for the Cheetah E. The background and gauge faces were made using photographs of the real aircraft. What makes this panel most interesting to me is that all of the gauges were coded in XML language. 27 July 2003 - I have moved the News from the first half of the year to a separate page. That will make this page load faster (for a while). You can view the earlier news here or use the links below for all news going back to the day this website started. Several people have asked for sounds for the Mirage. On occasion designers of aircraft have provided sound files in their aircraft packages. So I have added a new page listing those sound file sets that are available. In some cases the sound files have been separated from the original aircraft to keep the filesize down. In these situations permission to do so has been granted exclusively. So please do not upload these anywhere else. 22 July 2003 - Here is another destination for your Super Etendard flights. Jean-Jacques Herve, who lives near Lorient Lann-Bihoué BAN in the Bretagne region of western France, has updated his scenery of the BAN for FS2002. It is very detailed. AFCAD files and Mesh textures are also available for download from his website. Pierre Marchadier of the FsFrance.com group has completed eight texture sets in Armée de l'Air markings for inclusion with the upcoming Mirage 2000 by Cyril Pioffete. Pierre has sent a few screenshots which I have added to the Preview page. Cyril has now added an animated pilot figure to his Mirage 2000. You can view new screenshots (in addition to an important announcement) at his website. 16 July 2003 - FSIn-flight Magazine has published their 4th online issue. Among the usual interesting and timely mix of articles and reviews is a review of the Super Etendard by Romain Lucas. OK, I admit that I wrote the article but due to my involvement in the project I drew the line when it came to the final score. The editorial staff gave it very high marks none-the-less. Congratulations Romain on a job well done. 12 July 2003 - Eduardo Fadul and a few friends have started a virtual Columbia Air Force. Three Mirage aircraft designed by Denis and Daniel da Silva Oliveira are included in the list of available equipment. These include a Kfir C7, Mirage M5 COA and Mirage M5 COD. All have been repainted in current Fuerza Aérea Colombiana colors and markings. Cyril (Gator) Pioffet continues the work on his upcoming Mirage 2000. He has posted several new images of the cockpit on his website. 6 July 2003 - No new aircraft today. I'm enjoying the new Super Etendard. When I come upon something interesting I like to tell others about it. I've been experimenting with a program for FS2002 called TrafficTools by Lee Swordy. With this you can easily make the AI traffic do what you want (within limits). It is very easy to add new AI aircraft, airports, and flightplans. I added several flights of Rafale and Mirage between the airports on Corsica. Then I intercept them from Solenzara in the new Super Etendard. Leigh Jackson, a photographer in South Africa, has offered to share some of his images of the Mirage taken at various events and air shows in South Africa. For this first installment I've selected two special Mirage F1AZ. 3 July 2003 - If you downloaded the new Super Etendard Modernisé by Romain Lucas prior to today you may have noticed that there is no clock on the upper left canopy frame. This has been corrected. Instead of downloading the entire aircraft again, a patch is available to add the missing gauge to both the 2D instrument panel and the 3D Virtual Cockpit. 1 July 2003 - Romain Lucas of France, who gave us the outstanding Mirage 4000 last year, has released his Super Etendard Modernisé (SEM). Included in the package are three versions: clean, small external tanks, and large external tanks. Each version includes a unique set texture files as well. Also included is a new instrument panel and virtual cockpit made using new gauge files by Romain, his brother Laurent, and Eric Marciano. You can read my earlier preview here. Better yet, download the aircraft and experience it yourself. 28 June 2003 - A year ago this month Frédéric Hauger of France wrote to me asking if I had any information on Colmar-Meyenheim Air Base (LFSC) for a scenery project. Sadly I was not able to offer any assistance. But Frédéric continued on with his project and has just released a new scenery. It is very detailed (thanks in part to static elements by Fabian Prevost) and is framerate friendly. He has also provided AFCAD files	for complete ATC interaction. LFSC is home to the F1CT squadrons EC 1/30 "Alsace" and EC 2/30 "Normandie-Nieman". I made a mistake in the numbering of the South Africa Air Force Mirage IIICZ from about a week ago. Anyone downloading the complete aircraft now will get the correct textures. To download only the corrected textures click here. 23 June 2003 - Eric Marciano has completed some additional work on his Mirage 4000 radar and HUD gauge for the upcoming Super Etendard by Romain Lucas. To our immediate benefit, Eric has made the updated radar and HUD gauge available now. The big news in this new version is that is that the radar gauge is now visible in Virtual Cockpit mode, making interceptions even easier. This update is a very good reason to experience the Mirage 4000 by Romain Lucas with instrument panel by Eric Marciano if you haven't already done so. 21 June 2003 - Earlier this year Jason Ashworth sent two unreleased Mirage IIICZ visual models and gave me permission to repaint textures for them and make them available when I had the time. The first one is now available. It represents a Mirage IIICZ as it appears now at the SAAF Museum in Pretoria and is armed with a pair of Kukri air-to-air missiles. 18 June 2003 - Hopefully this page will be visible on the date I've indicated. Sorry for the downtime of this website for the last couple of days. I'm not unveiling a visual overhaul. Someone at my website host company screwed up. Other than this slight inconvenience, they are a good company and the hosting is a great deal. I'll pay the bill even earlier next year so this doesn't happen again. 14 June 2003 - Ernest Laverdure has updated the CFS2 Weapons Package he released last year for use with the unarmed Mirage 2000B and C versions by Denis and Daniel da Silva Oliveira based on the original by Oxyd. He has also released a CFS2 Weapons package for use with the RFN Super Etendard by Sonny (available exclusively from the 'la Royal French Navy' website). Both packages increase the visual effectness of the weapons. I have revised the scenery downloads section to no longer depend on the "I'm too busy to serve you" nature sometimes experienced with the remaining IFSA servers. The scenery files are now stored locally so availability should be 100%. Please let me know if you encounter any problems. 10 June 2003 - After a brief pause, Cyril (Gator) Pioffet has returned to the Mirage 2000 project and is giving it his full attention. Cyril has sent me updates during the development of this Mirage 2000 model and just sent another beta version. While flying it around I've made a few screen shots (below). You can view more of them here. Cyril has also made new images of the virtual cockpit available on his website. 7 June 2003 - Since returning I've been surfing around to see what news there is. Here are a couple of items. While visiting Eric Marciano's website I found a very easy way to enhance the readability of the Mirage 4000 HUD display in Virtual Cockpit mode. You can read Eric's description here. I tried it and it should work really well for any panel using the M4000 HUD gauge. Cyril (Gator) Pioffet has posted several new images of his upcoming Mirage 2000. These all show a Mirage 2000C in the markings of EC 1/2 "Cigognes" and carry a mix of Matra Magic and Matra Mica air-to-air missiles in addition to fuel tanks. The in-flight images are very good and you may have to remind youself that it is only a simulation. Additional images showing the development of the model from the beginning are also available for viewing. 4 June 2003 - Things haven't come to an abrupt stop, I've just been out of town for a couple of weeks. Romain Lucas wrote to say that work continues on the Super Etendard. He and his brother have been working on some new gauges for the project. Romain has also been working on the Dynamic Virtual Cockpit (DVC). I have added some new images showing the progress to the earlier Preview Page. 17 May 2003 - We have three new Spanish Mirage F1 texture sets this week. The first is a two-seat Mirage F1BE in the latest low-vis overall gray scheme worn by the Ejercito d'Aire Español. This set was put together by Pablo Fernandez de Bobadilla of Spain (with some adjustments by myself) based on the earlier F1M textures by Manuel Marín Carrión. The second set is by Manual and depicts a Mirage F1CE of the Ejercito d'Aire Español in the original Lagarto (lizard) camouflage scheme worn by the Spanish Mirage F1 when delivered in 1975 (shown below). And finally, I have adapted Manuel's Lagarto textures to make a two-seat Mirage F1BE as originally delivered in 1980. I will be away until the first week of June so enjoy the remainder of May, the year is going by fast. 16 May 2003 - A couple of weeks ago I was given the opportunity by the editors at FSIn-flight Magazine, a new Flight Simulator Ezine, to write an article to describe and promote the Mirage website. You can read it here. Oh yea, three new aircraft texture sets coming tomorrow. 11 May 2003 - Nick (Nikos) Delhanidis, who last year designed a fictional Hellenic Air Force display team using the Mirage F1CG, sent several images of the real Mirage F1CG in Hellenic Air Force service. I've compiled them with some comments in a Slide Show. And I've made a new set of textures for Jason Ashworth's Cheetah C in the lighter air-to-air camouflage scheme and in the markings of Cheetah C No. 344 assigned to the TFDC. 3 May 2003 - A repaint of Cyril Pioffet's Rafale is available. It is painted in a camouflage scheme with fictitious markings for EC 1/2 "Cigognes". The repaint is by Aurélien of the FSFrance team. Another member of that team, Pierre Marchadier, will be painting several texture sets for Cyril Pioffet's upcoming Mirage 2000. FSFrance have also released a very nice model of another famous delta winged aircraft, the Concorde. Be sure to pay them a visit. By the way, Cyril (Gator) Pioffet has redesigned his GMaxFlight website again. Have a look. 27 April 2003 - As an exclusive to this website, Jason Ashworth has made his trio of Cheetah C versions available here as an early release. As described in the earlier preview, the three versions represent a clean aircraft, one configured for air-to-air, and one armed with a full load of bombs (below). These will not be available anywhere else until next month. Another exclusive! The version uploaded for wide distribution will be bundled with the new Cheetah C instrument panel from Jens-Ole Kjølberg. Why wait? You can get it here now. 25 April 2003 - Jason Ashworth, who has produced a steady stream of Mirage aircraft over the years, is getting ready to release a series of Cheetah C fighters in the very near future. Three armament versions will be included to demonstrate the varied roles of this very capable fighter-bomber. I've had the opportunity to preview them. Have a look. 18 April 2003 - Manuel Marín Carrión has released his own set of replacement textures for the Mirage F1 by Kirk Olsson. This aircraft is also an overall gray F1M of Ala de Casa 14, Ejercito d'Aire Español located at Los Llanos AB. 13 April 2003 - Pablo Fernandez de Bobadilla of Spain, who helped Manuel Marín Carrión with information and testing of his updated scenery for Los Llanos AB (see April 5 below), has sent a set of replacement textures for Kirk Olsson's Mirage F1 in the low-vis gray colors of the Ala de Casa 14, Ejercito d'Aire Español. Pablo's father is a Mirage F1M pilot at Los Llanos AB. 5 April 2003 - Manuel Marín Carrión of Spain has updated his scenery for Los Llanos Air Base. The air base, located near Albacete in southwest Spain is the home of the Mirage F1 wing, Ala de Casa 14. The new FS2002 scenery includes new textures, details and static aircraft. 1 April 2003 - I wish this was an April Fool's joke accidentally played a day early but it is not. Merrill C. Meigs Field (KCGX) in Chicago, for years the default startup airport for Flight Simulator, is closed. Shortly after midnight Sunday, (de)construction crews moved onto the field and marked the runway with large "X"'s to close it. This time they did not use paint. The runway and connecting taxiways were destroyed as huge trenches were cut across them. Using the excuse of "homeland security", and so he can build one more park area, Mayor Daley has closed down Meigs. For more information visit the Friends of Meigs website. 29 March 2003 - Jason Ashworth (Mirage F1, Cheetah D, Mirage IIIC and E) recently completed the requirements for a degree in Aeronautical Engineering. He has now started on his Masters degree project and when he has some spare time he is working on an FS2002 Cheetah C. Jason sent some photos of the Mechanical Engineering Lab where he had classes and close to where his new office is located. Short of joining the Air Force or working for a museum, this is about the only other way I can think of to be able to see and sit in a Mirage F1 any day you want. 23 March 2003 - As I mentioned last month, Romain Lucas of France (who gave us the superb Mirage 4000 last year) has been working on a new Super Etendard. As progress has continued, Romain has written and sent images. Recently he sent a beta version of the aircraft followed by another with fuel tanks and camouflage textures. The instrument panel and possibly a virtual cockpit are all that remain to be completed. In the meantime, I have put together a preview of this outstanding rendition. Have a look. 18 March 2003 - Cyril Pioffet has put his Rafale update on the back burner for a short time as he pushes forward with work on his Mirage 2000. I have been looking at the MDL as progress continues and must report that he has captured the shape very well. The model includes full animation including very realistic looking exhaust nozzels. He has already completed a preliminary set of textures in the markings of Escadron de Chasse 1/2 "Cigognes", the first Armée de l'Air unit to operate the aircraft back in 1984. He has made some screen shots available on the News page of his website. Have a look. You will be very impressed. 10 March 2003 - Eric Marciano has released an update to his radar and HUD for the Mirage 4000. Changes to the radar include keyboard control of the radar mode and range as well as an easier to read amber colored display. Changes to the HUD include a new, more legible, HUD ladder and a new CLosing Speed (CLS) display. The upgrade is available as a small download with only the effected files. I have also revised the panel.cfg file for the Mirage 4000 with afterburner effect and the Mirage F1 panel by Eric and myself. 1 March 2003 - In my wanderings around the Internet I came upon the website of Manolo Machuca Medina of Spain. The main focus is aircraft operating in Spain and among them is a repaint of Jason Ashworth's Mirage IIIEZ in the camouflage and markings of a Mirage IIIEE (C.11) of the Ejército del Aire Española. Manolo has done a very nice job of reproducing a weathered camouflage finish in the correct colors. 23 February 2003 - Cyril Pioffet is working on an update to his Rafale to add fuel tanks and a revised fuel gauge for the instrument panel to accurately show the internal and external fuel status. The work is nearly complete. Images can be viewed on his website. Cyril has also been working on a new Mirage 2000. Below is a preview image from a test flight I made. The aircraft hasn't been textured yet but even at this stage you can see that he is accurately capturing the smooth outline of this fighter. 14 February 2003 - Y-Raymond sent me a series of photographs of the Mirage IIIEX prototype displayed at the Musée Européen de l'Aviation de Chasse. Similar to the Mirage IIING proposal by Dassault, I don't believe there were any customers. The closest aircraft we have visually in Flight Simulator is the Mirage 50EV. Enjoy the photos. 9 February 2003 - Denis and Daniel da Silva Oliveria have released an upgrade for their entire line of Mirage aircraft. The file, up_grade_air_mirages.zip includes new *.AIR and *.CFG files for all 16 of their Mirage aircraft. When the da Silva brothers aren't making new aircraft they are building instrument panels. They have just released three new instrument panels designed to compliment their Mirage IIIEBR (upgraded), Mirage IIIRS, and Denel Cheetah C / IAI Kfir 2000. 5 February 2003 - I was testing some of the Links this week and found that Sonny had added a newly painted Super Etendard to his La Royal French Navy website (look for it under "Avions/Avions Actuels"). This one has a very nice set of textures and is the sixth Super Etendard based on the model by Thierry Romain. There are two new Super Etendard in the works. Romain Lucas, who released the great Mirage 4000 this past summer, wrote to say he was working on one. And Cyril Pioffet, who released the new Rafale this past year, also has one in the works. Images of Cyril's version can be viewed at his GMax FS2002 website. Have a look. 1 February 2003 - Today is a sad day for aviation with the tragic loss of the Space Shuttle Columbia and crew of seven during re-entry. They are at peace now but my prayers, and I hope yours as well, are with their families in this time of grief. 25 January 2003 - For the past couple of months I've been working with Chuck Dyer (Mirage IIIEBR & IIIDBR for CFS2 last year) and Kirk Olsson on a set of CFS2 conversions of Kirk's awesome Mirage F1. There are plans for six versions. The first three are available now and include the F1B, F1C-200 (below), and F1CR. FS2002 versions will also be made available. Most will include textures for a new aircraft. Each aircraft MDL file has been optimized for CFS2, and features improved frame rates along with some visual tweaking. The weapons packs are very extensive with unique loadouts for each aircraft type depending on its role with the Armée de l'Air. Chuck has also received permission to modify Francis Ponvert's Mirage F1 panel for use in CFS2. The panel, combined with a sound file set, is available as a separate download. Be sure to visit Chuck Dyer's Smokin'Hawks website. 15 January 2003 - In the past I've been asked if there was a Virtual Airline (VA) designed around flying French military aircraft. There is one now and it is called L'Armée de l'Air Virtuelle. If you are interested (and read/write French) pay them a visit. While looking around their website I found a new scenery file for Dijon-Longvic AB, a very important Armée de l'Air airbase. I've added it to the scenery page. Last year Y-Raymond painted a nice Mirage 2000-5F in the colors on EC 1/2 "Cigognes" based at Dijon-Longvic. For something new to fly from Dijon-Longvic, I have repainted his textures in the markings for a Mirage 2000C of EC 3/2 "Alsace" as it appeared in 1990. EC 3/2 "Alsace" now flys the Mirage F1CT. Stand by, an F1CT is coming soon. 6 January 2003 - Just after the release of the Mirage 4000 this past summer, Eric Marciano sent the parts for an update to his earlier Mirage F1 panel. This new version included his functional radar gauge. I have finally assembled the necessary gauges, added a couple I thought would be useful, and the new Mirage F1 panel is now available. Here also are some images of the Musée Européen de l'Aviation de Chasse sent in by Y-Raymond. The museum has a quite a collection including the Mirage IIIA No. 9, Mirage IIIC No. 55, and the Mirage IIIEX prototype. 2 January 2003 - Happy New Year to all virtual pilots. I like this page when it is new and loads fast. We're off to a slow start but things will soon pick up. Between painting projects for Alpha Simulations, I spent a couple of hours repainting Jens-Ole Kjølberg's Mirage 2000BG textures as a Mirage 2000TH trainer of the Indian Air Force. If you are a regular visitor and haven't noticed yet, we are at a new URL -- www.Mirage4FS.com. So please update your bookmark.